The Q'eros are a Quechua-speaking people who live high in the Andes Mountains of southeast Peru. Q'eros is also the name of the cultural region that comprises the eight Q'eros' communities of Kiku, Hapu, Hatun Q'eros, Q'eros Totorani, Marcachea, Pucara, Q'achupata, and K'allacancha, which are located in the province of Paucartambo, approximately one hundred miles east of the ancient Inkan capital of Cusco. These communities all have their own corresponding annexes or hamlets, consisting of small isolated clusters of houses. Five of these communities, (the first five listed above) recently banded together in a statement of solidarity to form the "Nacion Q'eros." This documentary is based on Hatun Q'eros, the largest and most remote of the Q'eros' communities. The most distinct geographic characteristic of the Q'eros region is the area they inhabit, which spans from 6,000 feet up to 15,500 feet, moving from cloud forest to snow-capped mountains in a distance of about twenty miles. The rapid change, combined with the humidity created by the Amazon, renders three ecological zones within proximity of each other, each with its own characteristic productivity: 1) Puna or loma (13,500 - 15,500 feet), for raising llamas and alpacas; 2) qheswa (10,500 - 13,5000 feet), for cultivating a variety of potatoes and tubers and raising European-introduced sheep and cows; and 3) yunga (called monte by the Q'eros, 6,000 - 8,500 feet), for cultivating corn, squash, peppers, and various types of bamboo and wood. They spend most of their time in the high altitudes, caring for the llamas and alpacas. Exploiting three ecological zones has promoted self-sufficiency among the Q'eros. 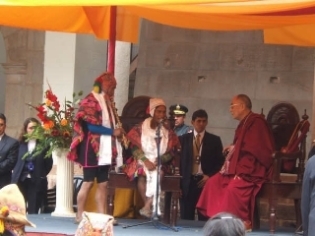 Because of this self-sufficiency and their relative isolation, the Q'eros have maintained many of their traditional customs, such as their music, which other Andean groups no longer practice. 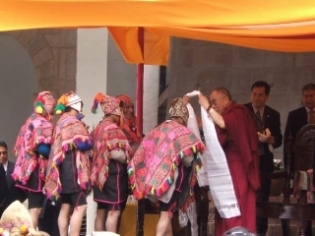 In May 2006, during the Dalai Lama's visit to South America, some Q'eros were chosen to participate in his visit to Cusco, as representatives of 'authentic' Andean culture. They conversed with him about their lifestyle, and closed the meeting by singing the traditional Q'eros' song, "Thurpa." Peru's National Institute of Culture (INC) recently declared the Q'eros cultural group a cultural patrimony (patrimonio cultural), the first and only people in Peru to receive this recognition. The INC has begun a dialogue with the Nacion Q'eros about plans for ethno-development (etnodesarollo), giving the Q'eros a voice from which to plan their own future with outside assistance. This unique identity and position gives the Q'eros people a singular platform for indigenous leadership in southeast Peru.